Undoubtedly, one of the most expensive country Maldives was on top of my travel list. It has got the best beaches from around the world. The dream honeymoon destination for couples where I got the chance to hop around with Nitin in my birthday week. We planned for this trip in the month of June. We were both geared up to any how make this trip cost effective. We did lot of researches and gathered hell lot of information before making this trip to happen. ‘Male’ being the Main Island and the gateway to Maldives (as the airport of Maldives is located on this island) is equipped with lots of accommodation. But also being the most densely populated city, we were not in favor of staying there. We always wanted to experience the true beauty in a secluded island Resort, for which Maldives is famous for. And so we found, Paradise Island Resort, located in the North Male Atoll which is 15 Minutes ride from Airport. All set with required flight tickets and accommodation, now is the time I should share my average expenditure. 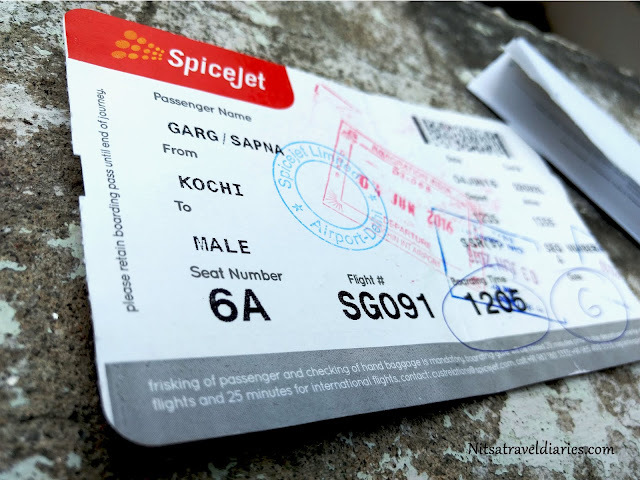 Flight tickets costs both for INR 36,000/- (for a couple) from Delhi and a beach bungalow stay at Paradise Island Resort costs us around INR 49,000/-per couple (Half Board – Breakfast and Dinner) for three nights and four days. If you are planning to experience the stay at ‘Water Villa’, I recommend to get it pre- booked. Option to upgrade to Water Villa for one or more nights is also available at the resort but that can cost you very high. 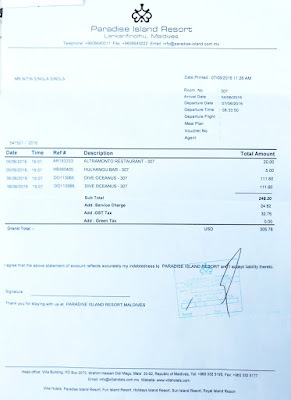 Scuba Costs us ($111 + Taxes) around INR 9,000/- per person that is INR 18,000/- for both of us. For Snorkeling we got our own equipment’s ready so we saved our penny from hiring them at the resort. (Snorkeling equipment cost – Rs.1,500 Two Set) And also, we did snorkeling at our own convenience any number of times at any location we liked. So we saved our money here also by not booking this activity. For other water activity, you can add INR 6,000/- more to your expenditure list. One, we both are non-Alcoholic drinkers. 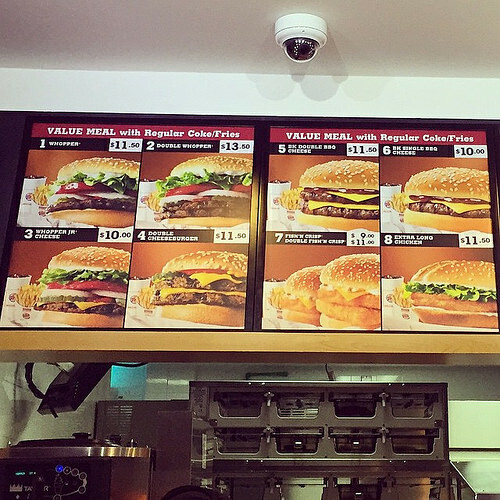 We spent ($ 11 * 2) around INR 1,500/- for buying Veg Burger Meal (Only vegetation Option available) at Burger King at the Airport on the day Maldives Arrival. A Long journey from Delhi to Maldives will always make you feel hungry once you reach the airport (Lunch not included in our package), so you have to compensate for that at airport) Also, the resorts are at some distance from airport where it is not necessary that you reach at the time of meal. We also spent ($ 20 + Taxes) around INR 1,600/- in buying pizza at the resort from 'Tramanto' (an Italian restaurant). – Not as per our taste buds – Definitely not for 1 person. Rest we had our ‘Ready to Cook’ eating stuffs with us – Our all time favorite, saves cost, as well as life savoir for Vegetarians. 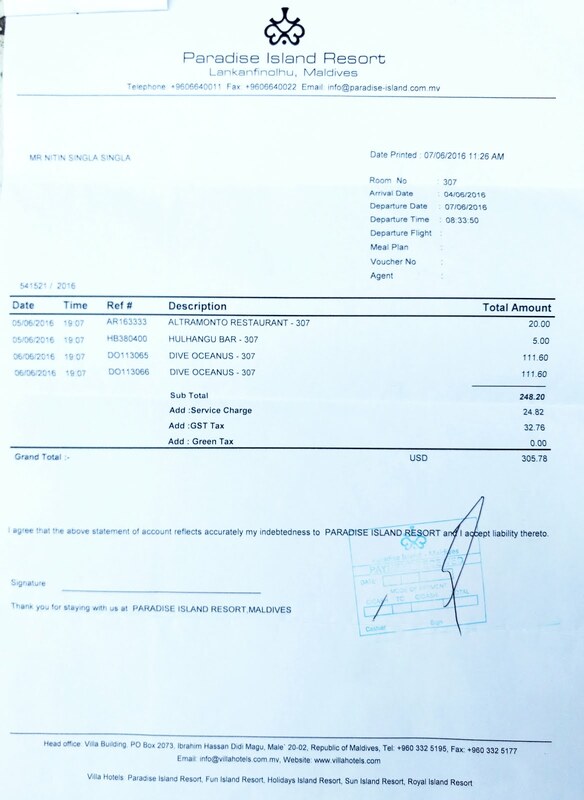 Total INR 1, 07,500 (Total) was spent by us in our trip to Maldives for three night and 4 days. A worth spent for a couple on such a romantic destination, a secluded one equipped with its own natural beauty. Maldives, for which I have already starting dreaming about and planning to visit it again to experience some more of islands and its beauty. thank you tips were very useful..do share more pics please..you guys are awesome. For more of the pics and tips on Maldives, you can read our other stories linked to this article. Since you visited in June, Was it raining in Maldives? How will be the weather in second half of May? Yes it did rain.. but only once in my 4 day trip to Maldives and that too just for 2 hours.. Weather would be rainy again in May too.. Thanks for submitting the article, it is quite nice. Frankly speaking, this is one of the greatest articles you shared. The Maldives has got the best beaches from around the world and I can only be jealous of you. This really cool place to relax and spend a couple of weeks. Thank you for this post because now I know how to make a trip cost effective.